The process of problem solving is systematic. It involves defining a problem and creating the solutions for it. It consists of using generic or ad hoc methods, in an orderly manner, for finding solutions to problems. It employs the abilities of the employees to use their knowledge, facts and data effectively for solving of the problems. Problem solving is an integral part of organizational life. Every time management directs employees for the production of a product or service, problems are being faced and solved and also decisions are being made. Every time an employee of the organization thinks of a new way to reduce costs, invents a new product or service, or determines how to help the organization function better in some way, problem solving is taking place. Today, problem solving is no longer an exclusive responsibility of the management. As the organization faces new and complex challenges in their effective functioning, employees in the organization are to undertake the duty and responsibility of solving workplace problems. For management, the development of creative problem-solving skills in employees is a necessity, not a luxury. The organization with innovative employees is most likely to survive and prosper. In the present day environment, all employees of the organization need to be prepared and equipped to meet the problem-solving challenges. In turn, organizations are to make substantial investments in developing the problem-solving skills of the employees. Management in environment of today is required to provide some type of problem solving training to the employees. Present day operating scenario of an organization is more complex and hence the resulting problems, too, are more complicated. Many organizations are facing stronger competition, increased customer expectations, and more aggressive delivery deadlines and all these against a backdrop that tolerates significantly less room for error. Each of these developments requires employees to tackle problems and develop solutions more proficiently and more rapidly. Formal, structured, highly efficient approaches ensure that employees from all parts of the organization are equipped with the ability to identify solutions and implement them in an optimal way. The aspects of problem solving which are considered as crucial to success of the organization are (i) developing creative, innovative solutions, (ii) developing practical solutions, (iii) showing independence and initiative in identifying problems and solving them, (iv) solving problems in teams, (v) applying a range of strategies to problem solving, (vi) use of budgeting and financial management to solve problems, (vii) applying problem solving strategies across a range of areas, (viii) testing assumptions taking data and circumstances into account, and (ix) resolving customer concerns in relation to complex issues related to customers. Problems can also be classified into two different types (ill-defined and well-defined) from which appropriate solutions are to be made. Ill-defined problems are those that do not have clear goals, solution paths, or expected solution. Well-defined problems have specific goals, clearly defined solution paths, and clear expected solutions. These problems also allow for more initial planning than ill-defined problems. Being able to solve problems sometimes involves dealing with pragmatics (logic) and semantics (interpretation of the problem). The ability to understand what the goal of the problem is and what rules can be applied represents the key to solving the problem. Sometimes the problem requires some abstract thinking and coming up with a creative solution. There is hardly ever one unique way to solve a problem. Some problems lend themselves to a wide variety of solution methods. As a rule, employees need to be encouraged to consider alternative solutions to a problem. Indeed, it has been said that it is far better to solve one problem in several ways than to solve several problems, each in one way. In addition, many problems may require more than one strategy for solution. All aspects of a particular problem must be carefully inspected before embarking on a particular strategy. The important practices in solving of the problems are (i) working backwards, (ii) finding a pattern, (iii) adopting a different point of view, (iv) solving a simpler, analogous problem (specification without loss of generality), (v) considering extreme cases, (vi) making a drawing (visual representation), (vii) intelligent guessing and testing (including approximation), (viii) accounting for all possibilities (exhaustive listing), (ix) organizing data, and (x) logical reasoning. Normally in the work environment of the organization, there lie the following three central challenges to solving workplace problems. While it is obvious that the effective implementation of solutions is critical, for the organization being able to execute solutions in a timely and cost effective manner presents the greatest challenge. Employees who solve problems in the absence of a systematic framework may squander precious time and assets through experimenting, using outdated methods, and/or overlooking crucial variables. People themselves are an essential part of the equation. Without working relationships among stakeholders, even the best process is less likely to realize results. The key to finding efficient and successful problem resolution is approaching the process with a systematic and logical methodology and accomplishing this through positive interpersonal interaction. A straight forward and impactful results oriented approach to problem solving is shown in Fig 1. In any organization, successful problem solving translates into enhanced productivity and increased profit. The more efficiently, effectively, and quickly problems get resolved the greater is the tendency for improved employee morale, enhanced production capabilities, and realization of fewer man-hours lost or wasted. Achievement of successful problem resolution continues to remain an important objective in an organization for decades. For over 50 -60 years, a variety of structured approaches have been introduced. From control charts for statistical problem description, to Deming’s model for distinguishing phases of problem solving, to Juran’s focus on the diagnostic and remedial phase of problem solving, various organizations have experimented with a host of approaches and methodologies. In the 1980s and 1990s, the approach shifted to the adoption of quality systems, such as total quality management (TQM), which moved the focus from problem solving towards problem prevention. And, into the early 21st century, the organizations have been testing ‘Six Sigma’ (a measure- analyze-improve-control model). Present day organizations appear to be utilizing an assortment of approaches and methods; some formal, such as Six Sigma, and some not so formal, such as following intuition or hunches. With a heavy turnover of the employees experienced by the organizations these days, the organizations have a workforce shaped by mixed talents, skills, and experiences; hence varying problem solving practices. Successful organizational management recognizes the value of structurally controlled problem-solving methods to promote discipline and increase the chance for success. Problems must first be defined before an investigation of the causes can begin. Designing and implementing solutions are the next phases of the process. Naturally, describing the problem accurately and communicating the problem clearly to the employees in the organization is critical for successful problem solving. Utilization of some form of problem-solving technique in the organization is critical to the organizational success. In addition, besides communication skills, strategic skills, technical skills, and decision making skills, the problem-solving skills of the employees are among the top skills needed by the organization for meeting the present day challenges. The management today requires a model problem solving technique that can filter through information overload or a number of issues and emotions to identify the root cause and then develop solutions for potential implementation. This technique requires taking the base problem down to smaller parts for more effective resolution and management. It is often thought that problem solving is more of a team-oriented exercise that tends to involve a number of employees to identify root cause, develop solution alternatives, and finally, carry out implementation. But these days in a time with rapidly changing markets, constantly moving targets, and unforeseen obstacles appearing daily, individual employees, now more than ever, need to have the skills necessary to map their way through a network of issues and dilemmas, and that includes effective problem-solving skills. Employees experience several problems at their workplace. These problems may range from quality assurance and process breakdowns to a customer receiving an inaccurate product. Workplace problems surface daily and may be routinely classified into one of three primary sources namely (i) technical, (ii) human, and (iii) policy/process. Problems may arise as the result of technical errors, such as a network server being down, preventing employees from retrieving important information. Some problems may be the result of human errors, such as ineffective communication between departments and teams. And yet another set of problems may be policy-, procedure-, or process-related, such as having too much downtime or, conversely, being completely overworked. Then again, some problems may emerge from a combination of all three sources. Present day workplace environment requires that all the employees of the organization need to be prepared and equipped to solve problems. Like the diverse nature of problems themselves, there are likewise several different problem solving techniques. Some problem solving approaches may resort to simple ‘troubleshooting’ when in a tough situation. Some problem-solving methods are more creative in nature and may include brainstorming and obtaining different points of view. Some techniques assume a more investigative viewpoint and may include using personal insights and intuition, check sheets, or formal surveys. Some problem solving practices are more analytical and structured and may include flowcharts or graphic representations of quantifiable data which call attention to specific concerns by visually displaying complex information. There are also some approaches which are considered to be more or less aligned with convergent thinking such as rating solutions, ranking solutions, and developing risk analysis matrices, which is a tool that identifies and evaluates risks of each solution option. And there are other tools associated with analytical thinking including Gantt charts or force field analysis which is a technique that identifies the facilitators and inhibitors of solution options. Some of the important approaches for resolving workplace problems are as follows. Root cause analysis – It is conducted to identify what the exact problem is for the development of steps to improve the situation and hopefully stop the problem from occurring again. Empowerment – Involved employees may have solution to the problem. It is always better to take their suggestions for potential solutions. Taking of their opinion not only improve the communication but involve them in the solution finding process. Flowcharting – Flowcharting of the problems is just the starting process to draw out the problem and identify a process to fix the problem. Asking others – Often sharing of the problem with others outside of the issue to get their opinion and seek other points of view helps in finding solution to the problem. Investigative – Investigative approach consists of asking, ‘why’, ‘how’, ‘when’, etc., and begin peeling back the onion to get to the root of a problem. The investigative approach makes one move all the way through and solving problems along the way. Learning from History – Very often looking for precedence of both the problems and the problem solutions employed in the past helps in finding a solution to mitigate the problem. Many a times past history and reflections on similar situations in the past served as the greatest resource when tackling problems and designing solutions. Previous behaviour often dictates future behaviour. This is found valid in many a situation. In many instances, it is important to have as many data points and facts as possible before communicating with involved employees and attempting to solve the noticed problem. Determining when one has enough information is no simple task unto itself. The key, overall, is the finding of the solution to the problem quickly. Many of the organizations do not have a formal problem-solving approach. And while this presents some obvious obstacles, for those organizations which have embraced a formal methodology, there may be challenges as well. Equal to the pressures of rapidly resolving problems is the anxiety that the organization may by strategic intent, default, or sheer comfort align itself with one rigid approach to solving problems. A successful organization usually tailors its problem-solving methods to the problems themselves, and this may include customizing available tools and techniques to the individual problem. It is also important to note that several managements have concerns over the use of ineffective and cumbersome structured approaches to solving problems. Normally these managements feel that it is important to have formal approaches to solving problems, but at the same time they are sometimes difficult to follow and consume too much time that generally not available. Some organizations believe all problems are different, but using a structured and impactful process yields success. Present day environment often commands the organizations to do everything faster, more cost effectively, and with higher quality. This is no easy task in an age of stress and information overload. In the process to deliver, employees generally get bogged down in a sea of data or fail to tap into existing information that might further retard their efforts. At the same time, employees often develop solutions and action plans that never get fully implemented. Results from these efforts are frequently mediocre and add more complexity and frustration to an already challenging situation. ‘This is the way it is always being done’ is an attitude that is a major barrier to implementation. Sometimes employees responsible for implementing the solution have not been asked to participate in solution development activities, so there is some resistance and lack of buy-in as they do not see the value or benefits to implementation. Human failure takes place when employees are not taking ownership or responsibility for getting the solution implemented. Poor communication or communication breakdowns about who is responsible for what, when, where, etc. is also a barrier in the implementation of problem solving solutions. Lack of management commitment to getting the changes to take place is another barrier in the implementation of problem solving solutions. Sometimes employees do not know how to implement the solutions. That can be due to a lack of communication or a lack of education about how to implement an action plan. NIH or ‘Not Invented Here’ is the attitude which the employees may have. With the attitude that ‘it (the solution) cannot work here since it has not been invented here’ employees often do not care for the solutions which have been successful in finding solution to the problem at other place. Time can also be a barrier. This means that the time it takes to implement solutions is not available or there is time urgency that does not allow for good implementation practices. Other barriers which are common in implementing solutions for the problems include employee turnover, lack of team motivation, poor morale, complacent management and employees, and new employees too fresh to the organization to understand what needs to be done. These barriers can significantly contribute to failed implementation efforts. Overcoming them requires effective management which is able to develop well-defined action plans that include clearly defined responsibilities and accountabilities. There are six steps to implementation success. These are (i) to get the details right, (ii) to enlist ongoing support, (iii) to provide for contingencies, (iv) to energize effort, (v) to monitor and evaluate, and (vi) to celebrate and share success. After lobbying and negotiating for the needed solution resources, effective management monitors progress, keep employees focused, continuously communicate, identify obstacles, proactively tackle the barriers, and lead the organization to successful adoption of the problem solving solutions. The necessity for the organization to have the ability for solving the problems efficiently, for creating the innovative solutions, and for leveraging the opportunities is more important than ever before. The key to achieving these outcomes lies in understanding two elements. By drawing on a common process and attending to the needs of the employees participating in the process, problem solving can efficiently and effectively generate results. Utilizing a problem-solving process in the organization is critical to addressing major operating issues. The ‘results process’ approach is a rigorous yet flexible approach to the problem solving process. This is a five-step process (given below) and provides the organized and orderly approach required for efficient and timely problem resolution. The ‘results process’ incorporates tools to expand and focus the thinking of problem solvers. Recognizing and using four types of thinking namely (i) open, (ii) exploratory, (iii) analytical, and (iv) convergent helps employees approach the problem from multiple perspectives. Problem solving is meaningless if solutions are not implemented. The biggest hurdle for workplace problem solving today is the overcoming of the barriers to the successful resolution. 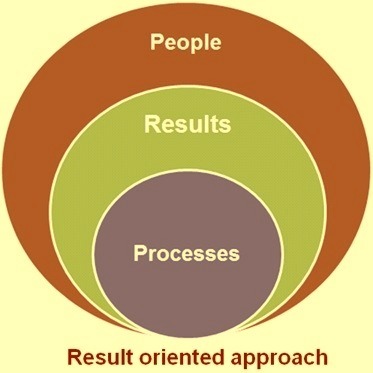 The ‘results process’ advocates a collaborative approach to problem-solving, focusing on consensus as the preferred approach to deciding on a solution and ensuring implementation success. Step-1 – It consists of quantifying of the gap. Solutions appear more quickly when employees define the gap between the current and desired state of affairs. By defining that gap in measurable terms, employees focus thought and effort where it counts most. Step-2 – This step uncovers the cause. Employees can identify an effective solution only when they have accurate information about the cause or causes of the problem. Without relevant data, employees’ efforts may address the symptoms but not the source of the problem. Step-3 – This step creates options. Generating a range of possible solutions makes it easier to find one that not only closes the gap, but also satisfies both the management and the employees. Step-4 – In this step the solution is decided. The chosen solution affects the organization as a whole beyond the employees who are finding the solution. In this step, management involves the right team of employees in the right way to increase their commitment to the success of the solution chosen. Step-5 – This step is for the realization of the results. Good solutions do not implement themselves. They require a comprehensive plan specifying what to do, who is to do it, and when it is to be done. Once efforts are underway, it is critical to evaluate how employees are doing, make needed adjustments, and celebrate accomplishments. Without attention to the needs of the employees, problem-solving efforts can fall short. With collaboration as an essential ingredient for effective problem solving, creating a supportive environment for problem solving becomes a critical element for success. How well the employees work together to solve problems depends largely on the presence of specific organizational conditions. These conditions are governed by the problem solving culture in the organization. The important aspects of the problem solving culture in the organization are given below. Building of trust – Lack of trust compounds any problem through hidden agendas, poor communication, and widespread suspicion. Where trust prevails, employees find it easier to work together and approach problems objectively. As a result, employees are more willing to make the collective effort necessary to solve shared problems. Leverages what employees do well – It is rare to encounter a problem that no one in the organization has seen it before. Employees of the organization have untapped strengths such as skills, talents, experience, contacts, and access to resources. Leveraging those strengths and building on past success can reveal shortcuts to solutions, as well as prepare the employees to take on more and bigger problems. Encourages innovation and measured risk – Real breakthroughs rarely occur in an organization that punishes sincere but failed attempts at innovation. When employees are encouraged to try new things and when earnest mistakes are treated as opportunities to learn, then creative problem solving becomes the rule and not the exception. By attending to employees’ needs and developing effective relationships, the organization can develop a culture that builds trust, leverages where employees do well, and encourages innovation and measured risk. The organization which strives to develop a comprehensive problem-solving and implementation strategy increases the speed and likelihood of resolution and allows everyone within the organization to assume successful problem solving responsibilities. This problem-solving strategy is to be balanced and flexible and include multiple structured method options so as to increase effectiveness and speed to resolution. The importance of having organized approaches for problem solving is to be understood in the organization. Orderly methods contribute positively to efficient and timely problem resolution and increase the odds of a successful implementation. Equally important as having a set process and empowered and inspired employees are critical to problem-solving success. Without positive interpersonal interaction, problem-solving is usually fruitless. Together, high-performing employees and an effective process combine to create a problem solving environment that produces results.